In the 70’s, Fizzies ruled the roost; there can be no doubt that, the Yamaha outnumbered the rest. Suzuki AP50’s and Honda SS50’s proved a great support act but none of these could hold a candle to a Garelli on song. 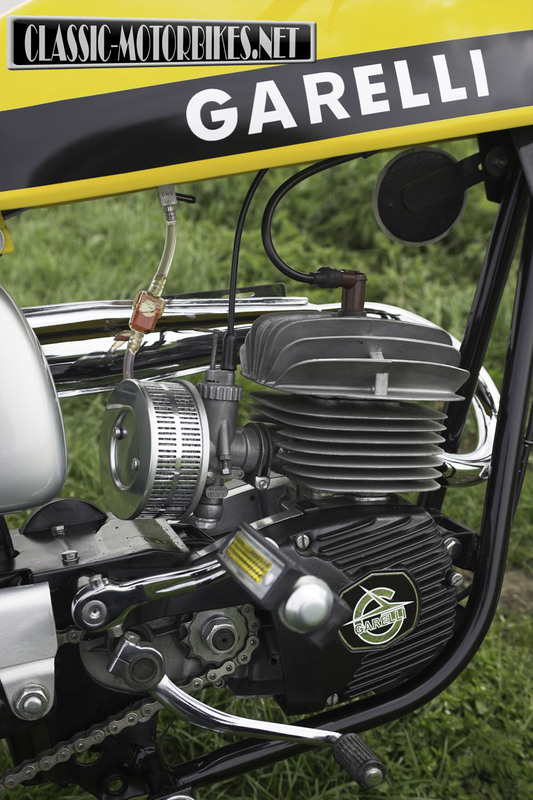 The stylish yellow and black machines turned heads wherever the piston port motor belched its hollow tune. 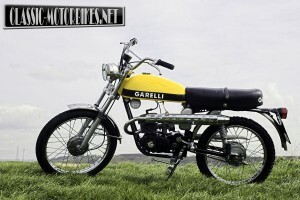 Compared to any of the oriental offerings the Garelli is a real superstar, the moped looks like a bike, and very nearly goes like one too, with a genuine 50 plus mph on tap for those capable of selecting the gears quick enough so as not to let the peaky engine drop out of the power band. 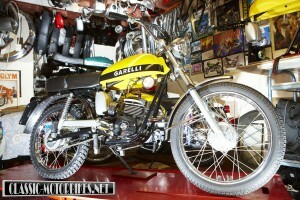 Unlike many other Latin machines that used the Minarelli based engine, Garelli designed their own, enabling them to fine tune the power output to their chassis and cycle parts. The Garelli engine is in a fairly high state of tune with aggressive porting, and a compression ratio that wouldn’t look too out of place in a diesel engine, but it lacks the torque that would enable it to pull out of the hole found in the lower revs. This requires the engine to be kept right up on the boil throughout the ride or risk being overtaken by one of those rice burning, fizzie things, and that would never do. Get it buzzing, throw a gear in every time the engine stops rising and you will be rewarded with a speedy ride at the head of any ‘ped pack. The first three gears pass quite quickly, leading you into a false sense of acceleration as you select top gear. It is once the fourth ratio is fully home that the engine adopts a new, less willing, tune. If the conditions are right then top gear will maintain a rise in the revs, albeit it a slower one, the slightest incline or head wind will see you slipping back rather sharply into third gear and staying there until you find a hill to go down. Unlike the Japanese machinery the gearshift is on the right hand side and can take some getting used to if all you have previously ridden is a conventional machine. It isn’t just the gearshift that causes familiarity problems however. The rear brake is the real problem to get used to, but be quick about it as the front brake alone is simply not powerful enough to have any major impact upon the bikes trajectory. 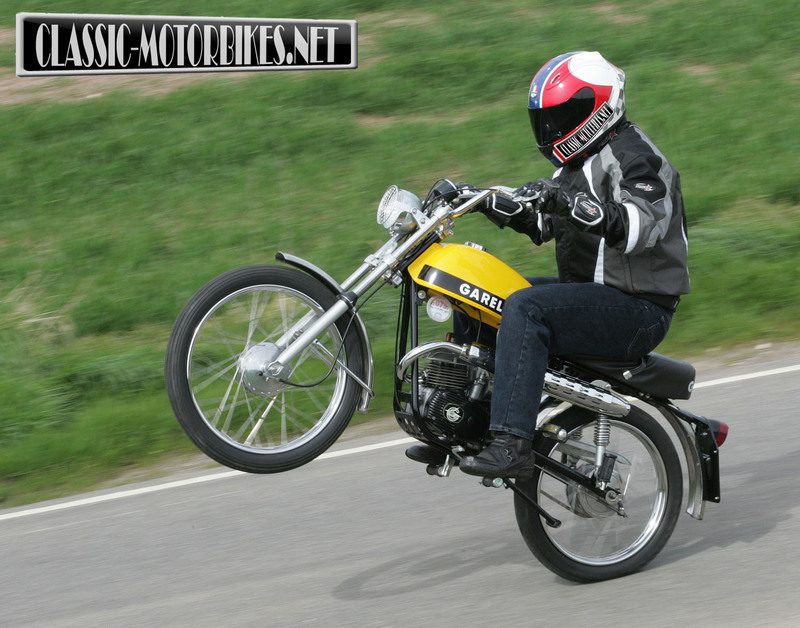 Compared to similar drum equipped machines, the Garelli is woefully inadequate in this area. All three of the Jap mopeds have 110mm diameter drums fitted at either end while the Garelli makes do with relatively tiny 90mm items, the stopping power provided by these isn’t anything to shout about. 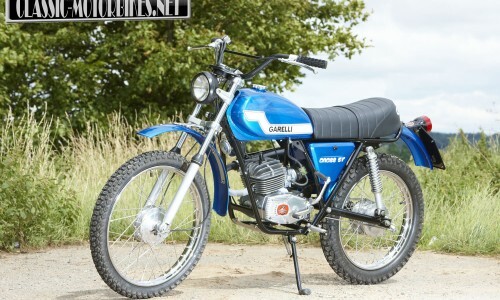 Add a bit of fork twist into the equation and you soon discover that the best bit about the Garelli is probably sitting outside a chip shop telling young ladies about the potential top speed. The Tigers roadster brother, the Rekord is often considered to be the faster of the two models and yet looking at the final drive ratio (3.45:1 compared to 3.15:1 for the off road style machine) reveals the Tiger Cross to have a set of sprockets far better suited to speed, if the engine could only pull it. In practise little separates the two in straight fight, although the size of the Rekord’s roadster tyres may well give it some advantage, and any race could easily be decided by the fastest person to change gear or the rider best tucked in, so close are the bikes real world performance. Handling is generally good; this is especially surprising considering the forks are completely undamped. They rely totally on the weight of the bike working against the springs for accurate road holding. Earlier, mark one, models did feature a more advanced hydraulic damped set up, and a luxurious sprung leather seat, but these were gradually phased out during the production run as cost savings where required to compete with other sports mopeds. Strangely enough the manual for the Tiger does recommend inserting some oil into each fork lower but this is to prevent corrosion and in no way helpful to the movement of the suspension. The Tiger is, without doubt, built to a price. The engine is not as well designed as the Fizzie and AP, and once disassembled can be considered down right agricultural. 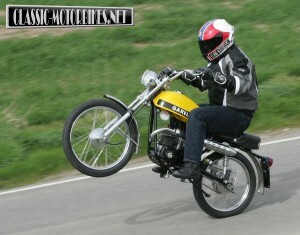 It is a sturdy beast though, and proved it can take the punishment metered out by the fledgling bikers of the mid 70’s. Despite the hidden technical shortcomings the Garelli Tiger, like its more racy sibling, looks every inch a real bike rather than the moped it really is. One has to look very closely to spot the pedals tucked away high up at the back of the engine. These pedals, unfeasibly lofty to ever be practical as a form of powering the Garelli, do serve a useful purpose however, by moving them in the reverse direction they double up as the kick-start lever promptly injecting life into the perky little two-stroke engine. They do get in the way while riding though and it is difficult to find a happy position for the pedals to sit in. when one leg is comfortably out of the way you can guarantee the other is digging in to a shin, or sitting over the gear or brake lever. Once started the free revving power plant ticks over with a lovely high pitched staccato voice that leads one to blip the throttle at regular intervals as if warming up for a race. Of course, back in the 70’s every journey was a race, either with yourself, imagining that the twisty B roads were some race track somewhere, or with a gang of mates on similar machinery causing all sorts of trouble and mayhem wherever you cast the blue haze of burnt two-stroke oil. The steel tube frame is a scaled down version of a big bike chassis too, no pressed tin monocoque jobbies, as seen on the leading Jap mopeds, to be found here. The engine is firmly bolted within a proper piece of framework and forms a substantial looking motorcycle. The fins around the cylinder and head look to be scaled up to give an impression of a larger engine than the 49cc that lurk in there, this helps in the cooling stakes as the revs have to be kept up high to get the best out of the engine. Even with all of this extra metalwork the Tiger Cross tipped the scales no heavier than a fizzie meaning that the substantially more powerful Garelli engine could leave all but the very best behind in its wake. 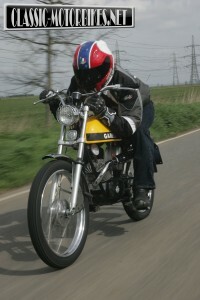 First introduced into the UK during 1972, the Tiger Cross was a pedal equipped, off road version, of the Rekord that had been present in the UK since 1969. The mark 1 Tiger is identifiable by its solid black stripe, which goes all the way to the bottom of the tank and also the polished aluminium engine casings. There is also an intermediate version, jokingly called the mark 1.5, that saw early paint scheme and engine casings married to the later forks. 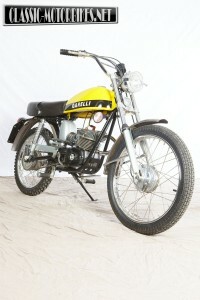 The mark 2 version, as seen here, has black engine casings, a yellow stripe below the black one on the tank and a more stylish seat. Later models also featured painted mudguards rather than the stainless steel items. Due to the cross over of parts from various models no particular date can be put on the mark 2’s arrival to these shores. In 1976 the Tiger received a UK only face-lift with a new, matt black and red paint job, high-rise front mudguard and black painted exhaust system. Adalberto Garelli received a degree in engineering at the age of 22 and devoted his early working life to perfecting the two-stroke engine for the Turin based Fiat Company. 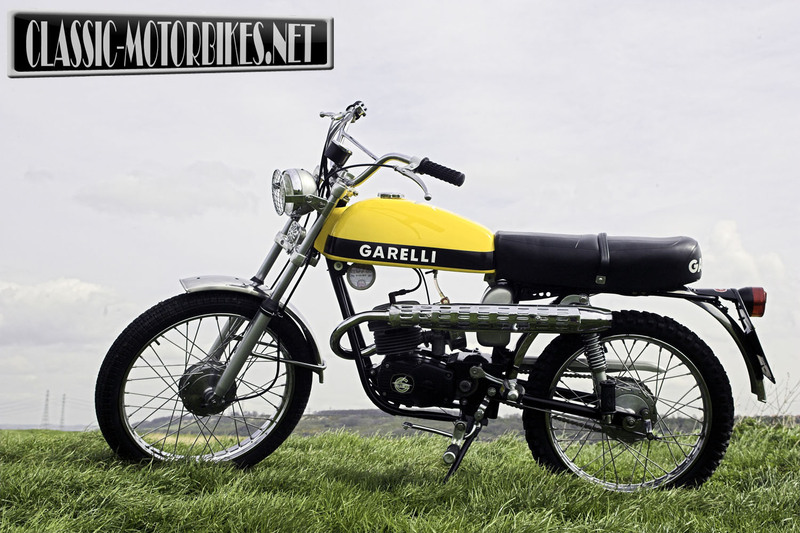 Garelli quit in 1911 due to Fiat’s lack of enthusiasm for the engine and set up his own company to continue his work. Garelli were at the very forefront of motorcycle design from the very start of this new venture. The first engine, a twin piston 350cc two-stroke appeared two years later in 1913. One piston sucked the inlet charge in and this was combusted in a joint combustion chamber across both piston tops before the second piston dealt with the exhaust charge. It was innovative and above all, very efficient, establishing the Garelli name in a very short space of time. It was also the first motorcycle to use internal drum brakes and after initial testing using a pre mix of oil and petrol became the first two- stroke to use a basic form of auto lube. The split single design lived on into the 1920’s and was set for a great success in the 1926 TT races. A 350cc machine fitted with four carburettors to feed the two pistons was proving very fast around the island circuit until a broken throttle cable saw the Garelli retire after only one lap in the junior race. After world war two, Garelli set about rebuilding its pre war successes by making a 38cc two stroke engine that could bolt onto a bicycle, effectively making it into an affordable, 20mph, moped. This proved a tremendous commercial success and later the unit was given a centrifugal clutch making its operation a very simple twist and go affair. 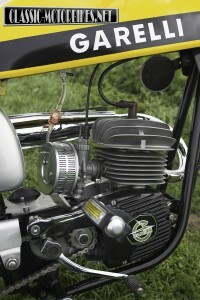 This engine formed the basis of virtually all of the Latin based scooters and was also the inspiration behind the engine seen fitted to the Tiger and Rekord. The Italian scooter giant, Agrati merged with Garelli in 1961 and combined their respective skills to give us a whole range of stylish and fast tiddlers. 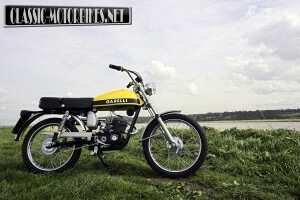 In 1969 Garelli did venture into larger capacity machines with the 150cc single cylinder four-stroke, the Gladiator. Based on a Laverda design, this was not well received; in fact it was largely ridiculed in the USA motorcycle press long before they tested it. 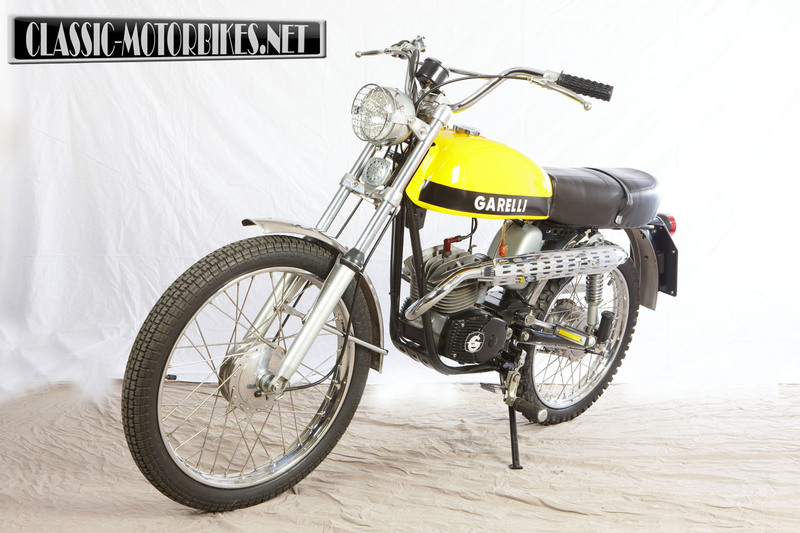 The pushrod motor was considered out dated, as was the performance claims made by the Garelli factory. 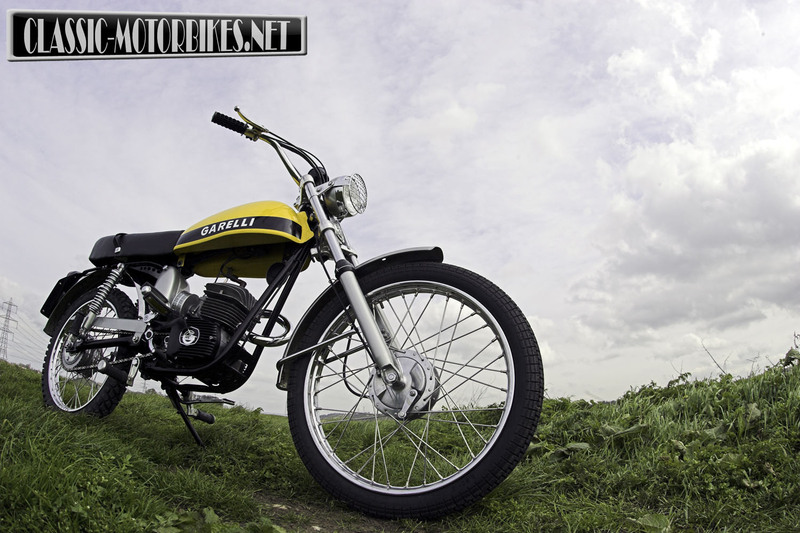 No one could doubt the performance of the smaller machines however, the Tiger Cross and Rekord 50cc and 80cc models were great sellers all over Europe. Garelli returned to racing after a break of some 50 years simply by buying out the 1981 Minarelli 125 Grand prix team and repainting the bikes in the Garelli livery. The move was a successful one and, with Spaniard Angel Nieto on board, they won the 125cc title at their very first attempt.